Vera & Johns online casino main campaign offer for new customers is a three step bonus ladder. The first offers a 200% bonus on the first deposit. The second is a 100% bonus on the second deposit and the third one is yet again a 200% bonus. This represents a way to really give incentive to the customers who really like Vera & John. Game types offered at Vera & John online casino are plenty. They do have some focus on casino game types like slots and table games. Betting is not yet offered to their customers. Tournaments and options are slightly limited which makes the casino games crowded which is great fun. Starting with Betsoft, Microgaming, Nyx, and NETENT, Vera & John online casino now works with a wide range of providers for casino software including Evolution Gaming, Bally, Play'n GO, IGT (WagerWorks), WMS (Williams Interactive), NextGen Gaming, Blueprint Gaming, Leander Games, Quickspin, Yggdrasil Gaming, Thunderkick, Pragmatic Play and Red Rake Gaming. Considering their expansion into the asian casino market and south american casino market its understandable to expand the casino software portfolio. Vera & John online casino have 8 different deposit options inlcuding, Ewallet (ecoPayz, Skrill, NETELLER), mobile payment (SEQR), mobile (Zimpler), online banking (Trustly), prepaid (paysafe) and credit card (VISA, MasterCard, VISA Electron). €10 is the minimum amount for deposit. Withdrawal options for Vera & John online casino are lesser than deposit options. Mobile Payment solution SEQR and mobile solution Zimpler can not accomodate withdrawal. Prepaid solution paysafe can not either. They do not accept withdrawal like for so many other casinos. The expected withdrawal time is the same as for many others, 3-5 days for credit cards. Ewallets are between 24-48 hours. With a earlier focus on scandinavia Vera & John online casino offer languages such as Swedish, Finnish and Norwegian. German has also been offered as well as English of course. With the expansion to Asia and South America Vera & John have added languages Japanese, Spanish and Portuguese. Currencies offered at Vera & John online casino is well suited for the markets they are present at including the big most popular currencies. These are Brazilian real, Denmark krone, Euros, British pound sterling, Hong Kong dollar, Norwegian krone, Swedish krona, Thai baht and US dollar. Accessible support for customers is something for everyone to strive for. Vera & John online casino can really hold their head up high with live chat 24/7 and mail telephone support. 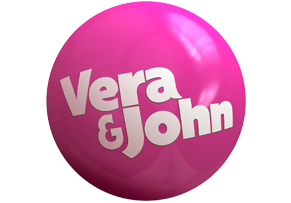 Being able to reach an online casinos customer support can be the absolute key to customer satisfaction so we give a big thumbs up for Vera & Johns support. Hopefully it continues and even improves. Vera & John online casino has stayed focus on casino types like slots and table games like Poker, Roulette and BlackJack. Their focus have also been on offering good variants on these traditional games like their offer of playing french, european or american roulette as an example. Slots remain the biggest with lots of Jackpots.